The adductors are those muscles that dancers love to stretch by sitting in second position – or with their legs in a wide V on the wall. 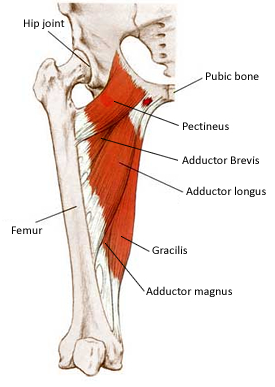 Their primary muscle action is adduction or bringing the leg to the midline of the body. I exquisitely felt my adductor muscles the first time I went horseback riding. 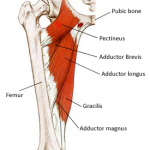 The adductor muscles can help or assist with hip flexion (at least up to 50 degrees of flexion). Now back to your question about using the inner thigh muscles to ‘feel’ your turnout. I started checking my anatomy books and other resources and found some said these muscles are weak internal rotators and some said weak external rotators. Not very helpful. Then I found a very interesting piece of research, (click here), that stated their research indicated the movement of external rotation during concentric contraction of the adductors. Yes! A study that supported when I had learned, which was the adductors can help maintain and stabilize (not create) your turnout when you are straightening out of a demi plié. How do you do that? By making sure that your pressing your weight through the 3 points of the foot into the floor while maintaining a level pelvis. Not just the heels – through the whole foot. When you press into your heels to wrap the inner thigh muscles forward that often tucks the pelvis under, locking the pelvis so you can ‘feel’ the top of the leg moving forward and turning out. Happens a lot in fifth position because so many dancers are standing in more turnout than what the hips are allowing. Correction? Work in a position that you can effectively use the primary turnout muscles. Using your turnout effectively is a dance between the lateral rotators of the hip (found deep in the buttocks) and the placement of the pelvis on the legs which we know can be strongly influenced by tightness in the iliopsoas muscle and/or weakness in the core abdominal muscles. As far as using the inner thigh muscles during extensions? We said that the primary function of these adductor muscles are to bring the legs together and in an extension you are abducting or taking the leg away from the midline of the body. So you can’t ‘use’ or concentrically contract the inner thighs to create an extension. They actually need to stretch (called an eccentric contraction) to allow the leg to easily lift above 90 degrees. So my response is that I don’t think it is a very useful image for teachers to use because it takes the focus away from where it should be – the deep lateral rotators of the hip. I find that when the pelvis and feet are correct as you described that the student gets a nice flat lengthened look at the top of the inner thighs instead of that little bulge that is considered normal. Knees not aligned over feet Stretching Concerns: How Much is Too Much?